"Haymarket bombing" redirects here. For the 2007 car bombs in London, see 2007 London car bombs. "Haymarket Riot" redirects here. For the band, see Haymarket Riot (band). This 1886 engraving was the most widely reproduced image of the Haymarket Affair. It shows Methodist pastor Samuel Fielden speaking, the bomb exploding, and the riot beginning simultaneously; in reality Fielden had already finished speaking before the explosion. The Haymarket affair (also known as the Haymarket massacre, Haymarket riot, or Haymarket Square riot) was the aftermath of a bombing that took place at a labor demonstration on May 4, 1886, at Haymarket Square in Chicago. It began as a peaceful rally in support of workers striking for an eight-hour day and in reaction to the killing of several workers the previous day by the police. An unknown person threw a dynamite bomb at the police as they acted to disperse the public meeting. The bomb blast and ensuing gunfire resulted in the deaths of seven police officers and at least four civilians; dozens of others were wounded. In the internationally publicized legal proceedings that followed, eight anarchists were convicted of conspiracy. The evidence was that one of the defendants may have built the bomb, but none of those on trial had thrown it. Seven were sentenced to death and one to a term of 15 years in prison. 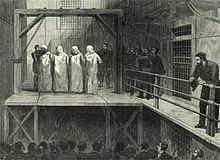 The death sentences of two of the defendants were commuted by Illinois governor Richard J. Oglesby to terms of life in prison, and another committed suicide in jail rather than face the gallows. The other four were hanged on November 11, 1887. In 1893, Illinois's new governor, John Peter Altgeld, pardoned the remaining defendants and criticized the trial. The site of the incident was designated a Chicago Landmark in 1992, and a public sculpture was dedicated there in 2004. In addition, the Haymarket Martyrs' Monument at the defendants' burial site in nearby Forest Park was designated a National Historic Landmark in 1997. Following the Civil War, particularly following the Long Depression, there was a rapid expansion of industrial production in the United States. Chicago was a major industrial center and tens of thousands of German and Bohemian immigrants were employed at about $1.50 a day. American workers worked on average slightly over 60 hours, during a six-day work week. The city became a center for many attempts to organize labor's demands for better working conditions. Employers responded with anti-union measures, such as firing and blacklisting union members, locking out workers, recruiting strikebreakers; employing spies, thugs, and private security forces and exacerbating ethnic tensions in order to divide the workers. Mainstream newspapers supported business interests, and were opposed by the labor and immigrant press. During the economic slowdown between 1882 and 1886, socialist and anarchist organizations were active. Membership of the Knights of Labor, which rejected socialism and radicalism, but supported the 8-hour work day, grew from 70,000 in 1884 to over 700,000 by 1886. 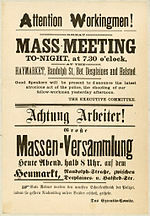 In Chicago, the anarchist movement of several thousand, mostly immigrant, workers centered about the German-language newspaper Arbeiter-Zeitung ("Workers' Times"), edited by August Spies. Other anarchists operated a militant revolutionary force with an armed section that was equipped with guns and explosives. Its revolutionary strategy centered around the belief that successful operations against the police and the seizure of major industrial centers would result in massive public support by workers, start a revolution, destroy capitalism, and establish a socialist economy. In October 1884, a convention held by the Federation of Organized Trades and Labor Unions unanimously set May 1, 1886, as the date by which the eight-hour work day would become standard. As the chosen date approached, U.S. labor unions prepared for a general strike in support of the eight-hour day. On Saturday, May 1, thousands of workers went on strike and rallies were held throughout the United States, with the cry, "Eight-hour day with no cut in pay." Estimates of the number of striking workers across the U.S. range from 300,000 to half a million. In New York City, the number of demonstrators was estimated at 10,000 and in Detroit at 11,000. In Milwaukee, Wisconsin, some 10,000 workers turned out. In Chicago, the movement's center, an estimated 30,000-to-40,000 workers had gone on strike and there were perhaps twice as many people out on the streets participating in various demonstrations and marches, as, for example, a march by 10,000 men employed in the Chicago lumber yards. Though participants in these events added up to 80,000, it is disputed whether there was a march of that number down Michigan Avenue led by anarchist Albert Parsons, founder of the International Working People's Association [IWPA], his wife Lucy Parsons and their children. The words "Workingmen Arm Yourselves and Appear in Full Force!" were removed from the revised flier. On May 3, striking workers in Chicago met near the McCormick Harvesting Machine Company plant. Union molders at the plant had been locked out since early February and the predominantly Irish-American workers at McCormick had come under attack from Pinkerton guards during an earlier strike action in 1885. This event, along with the eight-hour militancy of McCormick workers, had gained the strikers some respect and notoriety around the city. By the time of the 1886 general strike, strikebreakers entering the McCormick plant were under protection from a garrison of 400 police officers. Although half of the replacement workers defected to the general strike on May 1, McCormick workers continued to harass strikebreakers as they crossed the picket lines. Speaking to a rally outside the plant on May 3, August Spies advised the striking workers to "hold together, to stand by their union, or they would not succeed". Well-planned and coordinated, the general strike to this point had remained largely nonviolent. When the end-of-the-workday bell sounded, however, a group of workers surged to the gates to confront the strikebreakers. Despite calls for calm by Spies, the police fired on the crowd. Two McCormick workers were killed (although some newspaper accounts said there were six fatalities). Spies would later testify, "I was very indignant. I knew from experience of the past that this butchering of people was done for the express purpose of defeating the eight-hour movement." 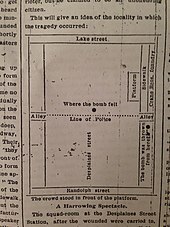 Outraged by this act of police violence, local anarchists quickly printed and distributed fliers calling for a rally the following day at Haymarket Square (also called the Haymarket), which was then a bustling commercial center near the corner of Randolph Street and Desplaines Street. 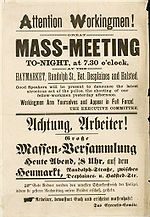 Printed in German and English, the fliers claimed that the police had murdered the strikers on behalf of business interests and urged workers to seek justice. The first batch of fliers contain the words Workingmen Arm Yourselves and Appear in Full Force! When Spies saw the line, he said he would not speak at the rally unless the words were removed from the flier. All but a few hundred of the fliers were destroyed, and new fliers were printed without the offending words. More than 20,000 copies of the revised flier were distributed. The rally began peacefully under a light rain on the evening of May 4. August Spies, Albert Parsons, and Samuel Fielden spoke to a crowd estimated variously between 600 and 3,000 while standing in an open wagon adjacent to the square on Des Plaines Street. A large number of on-duty police officers watched from nearby. There seems to prevail the opinion in some quarters that this meeting has been called for the purpose of inaugurating a riot, hence these warlike preparations on the part of so-called 'law and order.' However, let me tell you at the beginning that this meeting has not been called for any such purpose. The object of this meeting is to explain the general situation of the eight-hour movement and to throw light upon various incidents in connection with it. Following Spies' speech, the crowd was addressed by Parsons, the Alabama-born editor of the radical English-language weekly The Alarm. The crowd was so calm that Mayor Carter Harrison Sr., who had stopped by to watch, walked home early. Parsons spoke for almost an hour before standing down in favor of the last speaker of the evening, the British socialist Samuel Fielden, who delivered a brief ten-minute address. Many of the crowd had already left as the weather was deteriorating. A New York Times article, with the dateline May 4, and headlined "Rioting and Bloodshed in the Streets of Chicago ... Twelve Policemen Dead or Dying", reported that Fielden spoke for 20 minutes, alleging that his words grew "wilder and more violent as he proceeded". Another New York Times article, headlined "Anarchy's Red Hand" and dated May 6, opens with: "The villainous teachings of the Anarchists bore bloody fruit in Chicago tonight and before daylight at least a dozen stalwart men will have laid down their lives as a tribute to the doctrine of Herr Johann Most." It referred to the strikers as a "mob" and used quotation marks around the term "workingmen". I command you [addressing the speaker] in the name of the law to desist and you [addressing the crowd] to disperse. A home-made bomb with a brittle metal casing filled with dynamite and ignited by a fuse was thrown into the path of the advancing police. Its fuse briefly sputtered, and then the bomb exploded, killing policeman Mathias J. Degan with flying metal fragments and mortally wounding six other officers. Witnesses maintained that immediately after the bomb blast there was an exchange of gunshots between police and demonstrators. Accounts vary widely as to who fired first and whether any of the crowd fired at the police. Historian Paul Avrich maintains that the police fired on the fleeing demonstrators, reloaded and then fired again, killing four and wounding as many as 70 people. What is not disputed is that in less than five minutes the square was empty except for the casualties. According to the May 4 New York Times, demonstrators began firing at the police, who then returned fire. In his report on the incident, Inspector Bonfield wrote that he "gave the order to cease firing, fearing that some of our men, in the darkness might fire into each other". An anonymous police official told the Chicago Tribune, "A very large number of the police were wounded by each other's revolvers. ... It was every man for himself, and while some got two or three squares away, the rest emptied their revolvers, mainly into each other." In all, seven policemen and at least four workers were killed. Another policeman died two years after the incident from complications related to injuries received on that day. About 60 policemen were wounded in the incident. They were carried, along with some other wounded people, into a nearby police station. Police captain Michael Schaack later wrote that the number of wounded workers was "largely in excess of that on the side of the police". The Chicago Herald described a scene of "wild carnage" and estimated at least fifty dead or wounded civilians lay in the streets. It is unclear how many civilians were wounded since many were afraid to seek medical attention, fearing arrest. They found aid where they could. Engraving of police officer Mathias J. Degan, who was killed by the bomb blast. A harsh anti-union clampdown followed the Haymarket incident. There was a massive outpouring of community and business support for the police and many thousands of dollars were donated to funds for their medical care and to assist their efforts. The entire labor and immigrant community, particularly Germans and Bohemians, came under suspicion. Police raids were carried out on homes and offices of suspected anarchists. Dozens of suspects, many only remotely related to the Haymarket affair, were arrested. Casting legal requirements such as search warrants aside, Chicago police squads subjected the labor activists of Chicago to an eight-week shakedown, ransacking their meeting halls and places of business. The emphasis was on the speakers at the Haymarket rally and the newspaper Arbeiter-Zeitung. A small group of anarchists were discovered to have been engaged in making bombs on the same day as the incident, including round ones like the one used in Haymarket Square. Newspaper reports declared that anarchist agitators were to blame for the "riot", a view adopted by an alarmed public. As time passed, press reports and illustrations of the incident became more elaborate. Coverage was national, then international. Among property owners, the press, and other elements of society, a consensus developed that suppression of anarchist agitation was necessary while for their part, union organizations such as The Knights of Labor and craft unions were quick to disassociate themselves from the anarchist movement and to repudiate violent tactics as self-defeating. Many workers, on the other hand, believed that men of the Pinkerton agency were responsible because of the agency's tactic of secretly infiltrating labor groups and its sometimes violent methods of strike breaking. 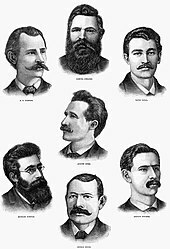 Engraving of the seven anarchists sentenced to die for Degan's murder. An eighth defendant, Oscar Neebe, not shown here, was sentenced to 15 years in prison. The police assumed that an anarchist had thrown the bomb as part of a planned conspiracy; their problem was how to prove it. On the morning of May 5, they raided the offices of the Arbeiter-Zeitung, arresting its editor August Spies, and his brother (who was not charged). Also arrested were editorial assistant Michael Schwab and Adolph Fischer, a typesetter. A search of the premises resulted in the discovery of the "Revenge Poster" and other evidence considered incriminating by the prosecution. On May 7, police searched the premises of Louis Lingg where they found a number of bombs and bomb-making materials. Lingg's landlord William Seliger was also arrested but cooperated with police and identified Lingg as a bomb maker and was not charged. An associate of Spies, Balthazar Rau, suspected as the bomber, was traced to Omaha and brought back to Chicago. After interrogation, Rau offered to cooperate with police. He alleged that the defendants had experimented with dynamite bombs and accused them of having published what he said was a code word, "Ruhe" ("peace"), in the Arbeiter-Zeitung as a call to arms at Haymarket Square. Rudolf Schnaubelt, the police's lead suspect as the bomb thrower, was arrested twice early on and released. By May 14, when it became apparent he had played a significant role in the event, he had fled the country. William Seliger, who had turned state's evidence and testified for the prosecution, was not charged. On June 4, 1886, seven other suspects, however, were indicted by the grand jury and stood trial for being accessories to the murder of Degan. Of these, only two had been present when the bomb exploded. Newspaper editor August Spies and Samuel Fielden had spoken at the peaceful rally and were stepping down from the speaker's wagon in compliance with police orders to disperse just before the bomb went off. Two others had been present at the beginning of the rally but had left and were at Zepf's Hall, an anarchist rendezvous, at the time of the explosion. They were: Arbeiter-Zeitung typesetter Adolph Fischer and the well-known activist Albert Parsons, who had spoken for an hour at the Haymarket rally before going to Zepf's. Parsons, who believed that the evidence against them all was weak, subsequently voluntarily turned himself in, in solidarity with the accused. A third man, Spies's assistant editor Michael Schwab (who was the brother-in-law of Schnaubelt) was arrested since he was speaking at another rally at the time of the bombing (he was also later pardoned). Not directly tied to the Haymarket rally, but arrested because they were notorious for their militant radicalism were George Engel (who was at home playing cards on that day), and Louis Lingg, the hot-headed bomb maker denounced by his associate, Seliger. Another defendant who had not been present that day was Oscar Neebe, an American-born citizen of German descent who was associated with the Arbeiter-Zeitung and had attempted to revive it in the aftermath of the Haymarket riot. Of the eight defendants, five – Spies, Fischer, Engel, Lingg and Schwab – were German-born immigrants; a sixth, Neebe, was a U.S.-born citizen of German descent. Only the remaining two, Parsons and Fielden, born in the U.S. and England, respectively, were of British heritage. 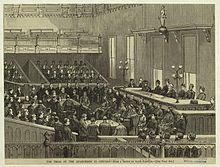 The trial, Illinois vs. August Spies et al., began on June 21, 1886, and went on until August 11. The trial was conducted in an atmosphere of extreme prejudice by both public and media toward the defendants. It was presided over by Judge Joseph Gary. Judge Gary displayed open hostility to the defendants, consistently ruled for the prosecution, and failed to maintain decorum. A motion to try the defendants separately was denied. The defense counsel included Sigmund Zeisler, William Perkins Black, William Foster, and Moses Salomon. Selection of the jury was extraordinarily difficult, lasting three weeks, and nearly one thousand people called. All union members and anyone who expressed sympathy toward socialism were dismissed. In the end a jury of 12 was seated, most of whom confessed prejudice towards the defendants. Despite their professions of prejudice Judge Gary seated those who declared that despite their prejudices they would acquit if the evidence supported it, refusing to dismiss for prejudice. Eventually the peremptory challenges of the defense were exhausted. Frustrated by the hundreds of jurors who were being dismissed, a bailiff was appointed who selected jurors rather than calling them at random. The bailiff proved prejudiced himself and selected jurors who seemed likely to convict based on their social position and attitudes toward the defendants. The prosecution, led by Julius Grinnell, argued that since the defendants had not actively discouraged the person who had thrown the bomb, they were therefore equally responsible as conspirators. The jury heard the testimony of 118 people, including 54 members of the Chicago Police Department and the defendants Fielden, Schwab, Spies and Parsons. Albert Parsons' brother claimed there was evidence linking the Pinkertons to the bomb. This reflected a widespread belief among the strikers. 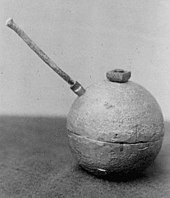 Exhibit 129a from the Haymarket trial: Chemists testified that the bombs found in Lingg's apartment, including this one, resembled the chemical signature of shrapnel from the Haymarket bomb. Police investigators under Captain Michael Schaack had a lead fragment removed from a policeman's wounds chemically analyzed. They reported that the lead used in the casing matched the casings of bombs found in Lingg's home. A metal nut and fragments of the casing taken from the wound also roughly matched bombs made by Lingg. Schaack concluded, on the basis of interviews, that the anarchists had been experimenting for years with dynamite and other explosives, refining the design of their bombs before coming up with the effective one used at the Haymarket. At the last minute, when it was discovered that instructions for manslaughter had not been included in the submitted instructions, the jury was called back, and the instructions were given. The jury returned guilty verdicts for all eight defendants. Before being sentenced, Neebe told the court that Schaack's officers were among the city's worst gangs, ransacking houses and stealing money and watches. Schaack laughed and Neebe retorted, "You need not laugh about it, Captain Schaack. You are one of them. You are an anarchist, as you understand it. You are all anarchists, in this sense of the word, I must say." Judge Gary sentenced seven of the defendants to death by hanging and Neebe to 15 years in prison. The sentencing provoked outrage from labor and workers' movements and their supporters, resulting in protests around the world, and elevating the defendants to the status of martyrs, especially abroad. Portrayals of the anarchists as bloodthirsty foreign fanatics in the press along with the 1889 publication of Captain Schaack's sensational account, Anarchy and Anarchism, on the other hand, inspired widespread public fear and revulsion against the strikers and general anti-immigrant feeling, polarizing public opinion. In an article datelined May 4, entitled "Anarchy's Red Hand", The New York Times had described the incident as the "bloody fruit" of "the villainous teachings of the Anarchists". The Chicago Times described the defendants as "arch counselors of riot, pillage, incendiarism and murder"; other reporters described them as "bloody brutes", "red ruffians", "dynamarchists", "bloody monsters", "cowards", "cutthroats", "thieves", "assassins", and "fiends". The journalist George Frederic Parsons wrote a piece for The Atlantic Monthly in which he identified the fears of middle-class Americans concerning labor radicalism, and asserted that the workers had only themselves to blame for their troubles. Edward Aveling remarked, "If these men are ultimately hanged, it will be the Chicago Tribune that has done it." 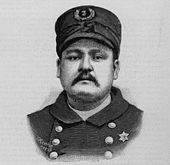 Schaack, who had led the investigation, was dismissed from the police force for allegedly having fabricated evidence in the case but was reinstated in 1892. The case was appealed in 1887 to the Supreme Court of Illinois, then to the United States Supreme Court where the defendants were represented by John Randolph Tucker, Roger Atkinson Pryor, General Benjamin F. Butler and William P. Black. The petition for certiorari was denied. After the appeals had been exhausted, Illinois Governor Richard James Oglesby commuted Fielden's and Schwab's sentences to life in prison on November 10, 1887. On the eve of his scheduled execution, Lingg committed suicide in his cell with a smuggled blasting cap which he reportedly held in his mouth like a cigar (the blast blew off half his face and he survived in agony for six hours). The next day (November 11, 1887) four defendants—Engel, Fischer, Parsons, and Spies—were taken to the gallows in white robes and hoods. They sang the Marseillaise, then the anthem of the international revolutionary movement. Family members including Lucy Parsons, who attempted to see them for the last time, were arrested and searched for bombs (none were found). According to witnesses, in the moments before the men were hanged, Spies shouted, "The time will come when our silence will be more powerful than the voices you strangle today." In their last words, Engel and Fischer called out, "Hurrah for anarchism!" Parsons then requested to speak, but he was cut off when the signal was given to open the trap door. Witnesses reported that the condemned men did not die immediately when they dropped, but strangled to death slowly, a sight which left the spectators visibly shaken. Notwithstanding the convictions for conspiracy, no actual bomber was ever brought to trial, "and no lawyerly explanation could ever make a conspiracy trial without the main perpetrator in the conspiracy seem completely legitimate." Historians such as James Joll and Timothy Messer-Kruse say the evidence points to Rudolph Schnaubelt, brother-in-law of Schwab, as the likely perpetrator. Among supporters of the labor movement in the United States and abroad and others, the trial was widely believed to have been unfair, and even a serious miscarriage of justice. Prominent people such as novelist William Dean Howells; celebrated attorney Clarence Darrow; poet and playwright Oscar Wilde; playwright George Bernard Shaw; and poet William Morris, strongly condemned it. On June 26, 1893, Illinois Governor John Peter Altgeld, the progressive governor of Illinois, himself a German immigrant, signed pardons for Fielden, Neebe, and Schwab, calling them victims of "hysteria, packed juries, and a biased judge" and noting that the state "has never discovered who it was that threw the bomb which killed the policeman, and the evidence does not show any connection whatsoever between the defendants and the man who threw it". Altgeld also faulted the city of Chicago for failing to hold Pinkerton guards responsible for repeated use of lethal violence against striking workers. Altgeld's actions concerning labor were used to defeat his reelection. Soon after the trial, anarchist Dyer Lum wrote a history of the trial critical of the prosecution. In 1888, George McLean, and in 1889, police captain Michael Shack, wrote accounts from the opposite perspective. Awaiting sentencing, each of the defendants wrote their own autobiographies (edited and published by Philip Foner in 1969), and later activist Lucy Parsons published a biography of her condemned husband Albert Parsons. Fifty years after the event, Henry Davis wrote a history, which preceded another scholarly treatment by Paul Avrich in 1984, and a "social history" of the era by Bruce C. Nelson in 1988. In 2006, labor historian James Green wrote a popular history. Christopher Thale writes in the Encyclopedia of Chicago that lacking credible evidence regarding the bombing, "...the prosecution focused on the writings and speeches of the defendants." He further notes that the conspiracy charge was legally unprecedented, the Judge was "partisan," and all the jurors admitted prejudice against the defendants. Historian Carl Smith writes, "The visceral feelings of fear and anger surrounding the trial ruled out anything but the pretense of justice right from the outset." Smith notes that scholars have long considered the trial a "notorious" "miscarriage of justice". In a review somewhat more critical of the defendants, historian Jon Teaford concludes that "[t]he tragedy of Haymarket is the American justice system did not protect the damn fools who most needed that protection... It is the damn fools who talk too much and too wildly who are most in need of protection from the state." Historian Timothy Messer-Kruse revisited the digitized trial transcript and argued that the proceedings were fair for their time, a challenge to the historical consensus that the trial was a travesty. During the late 20th century, scholars doing research into the Haymarket affair were surprised to learn that much of the primary source documentation relating to the incident (beside materials concerning the trial) was not in Chicago, but had been transferred to then-communist East Berlin. Historian Nathan Fine points out that trade-union activities continued to show signs of growth and vitality, culminating later in 1886 with the establishment of the Labor Party of Chicago. [T]he fact is that despite police repression, newspaper incitement to hysteria, and organization of the possessing classes, which followed the throwing of the bomb on May 4, the Chicago wage earners only united their forces and stiffened their resistance. The conservative and radical central bodies – there were two each of the trade unions and two also of the Knights of Labor — the socialists and the anarchists, the single taxers and the reformers, the native born...and the foreign born Germans, Bohemians, and Scandinavians, all got together for the first time on the political field in the summer following the Haymarket affair.... [T]he Knights of Labor doubled its membership, reaching 40,000 in the fall of 1886. On Labor Day the number of Chicago workers in parade led the country. On the first anniversary of the event, May 4, 1887, the New-York Tribune published an interview with Senator Leland Stanford, in which he addressed the consensus that "the conflict between capital and labor is intensifying" and articulated the vision advocated by the Knights of Labor for an industrial system of worker-owned co-operatives, another among the strategies pursued to advance the conditions of laborers. The interview was republished as a pamphlet to include the bill Stanford introduced in the Senate to foster co-operatives. Popular pressure continued for the establishment of the 8-hour day. At the convention of the American Federation of Labor (AFL) in 1888, the union decided to campaign for the shorter workday again. May 1, 1890, was agreed upon as the date on which workers would strike for an eight-hour work day. This sympathetic engraving by English Arts and Crafts illustrator Walter Crane of "The Anarchists of Chicago" was widely circulated among anarchists, socialists, and labor activists. In 1889, AFL president Samuel Gompers wrote to the first congress of the Second International, which was meeting in Paris. He informed the world's socialists of the AFL's plans and proposed an international fight for a universal eight-hour work day. In response to Gompers's letter, the Second International adopted a resolution calling for "a great international demonstration" on a single date so workers everywhere could demand the eight-hour work day. In light of the Americans' plan, the International adopted May 1, 1890, as the date for this demonstration. A secondary purpose behind the adoption of the resolution by the Second International was to honor the memory of the Haymarket martyrs and other workers who had been killed in association with the strikes on May 1, 1886. Historian Philip Foner writes "[t]here is little doubt that everyone associated with the resolution passed by the Paris Congress knew of the May 1 demonstrations and strikes for the eight-hour day in 1886 in the United States ... and the events associated with the Haymarket tragedy." The first International Workers Day was a spectacular success. The front page of the New York World on May 2, 1890, was devoted to coverage of the event. 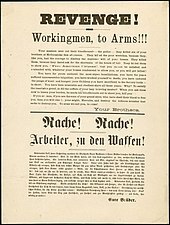 Two of its headlines were "Parade of Jubilant Workingmen in All the Trade Centers of the Civilized World" and "Everywhere the Workmen Join in Demands for a Normal Day". The Times of London listed two dozen European cities in which demonstrations had taken place, noting there had been rallies in Cuba, Peru and Chile. Commemoration of May Day became an annual event the following year. The association of May Day with the Haymarket martyrs has remained strong in Mexico. Mary Harris "Mother" Jones was in Mexico on May 1, 1921, and wrote of the "day of 'fiestas'" that marked "the killing of the workers in Chicago for demanding the eight-hour day". In 1929, The New York Times referred to the May Day parade in Mexico City as "the annual demonstration glorifying the memory of those who were killed in Chicago in 1887". The New York Times described the 1936 demonstration as a commemoration of "the death of the martyrs in Chicago". In 1939, Oscar Neebe's grandson attended the May Day parade in Mexico City and was shown, as his host told him, "how the world shows respect to your grandfather". The influence of the Haymarket affair was not limited to the celebration of May Day. Emma Goldman, the activist and political theorist, was attracted to anarchism after reading about the incident and the executions, which she later described as "the events that had inspired my spiritual birth and growth". She considered the Haymarket martyrs to be "the most decisive influence in my existence". Her associate, Alexander Berkman also described the Haymarket anarchists as "a potent and vital inspiration". Others whose commitment to anarchism, or revolutionary socialism, crystallized as a result of the Haymarket affair included Voltairine de Cleyre and "Big Bill" Haywood, a founding member of the Industrial Workers of the World. Goldman wrote to historian Max Nettlau that the Haymarket affair had awakened the social consciousness of "hundreds, perhaps thousands, of people". While admitting that none of the defendants were involved in the bombing, the prosecution made the argument that Lingg had built the bomb, and two prosecution witnesses (Harry Gilmer and Malvern Thompson) tried to imply that the bomb thrower was helped by Spies, Fischer and Schwab. The defendants claimed they had no knowledge of the bomber at all. Rudolph Schnaubelt was indicted but fled the country. From this photograph, a prosecution witness identified Schnaubelt as the bomber. 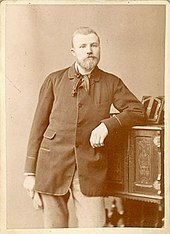 Rudolph Schnaubelt (1863–1901) was an activist and the brother-in law of Michael Schwab. He was at the Haymarket when the bomb exploded. Schnaubelt was indicted with the other defendants but fled the city and later the country before he could be brought to trial. He was the detectives' lead suspect, and state witness Gilmer testified he saw Schnaubelt throw the bomb, identifying him from a photograph in court. Schnaubelt later sent two letters from London disclaiming all responsibility, writing, "If I had really thrown this bomb, surely I would have nothing to be ashamed of, but in truth I never once thought of it." He is the most generally accepted and widely known suspect and figured as the bomb thrower in The Bomb, Frank Harris's 1908 fictionalization of the tragedy. Written from Schnaubelt's point of view, the story opens with him confessing on his deathbed. However, Harris's description was fictional and those who knew Schnaubelt vehemently criticized the book. George Schwab was a German shoemaker who died in 1924. German anarchist Carl Nold claimed he learned Schwab was the bomber through correspondence with other activists but no proof ever emerged. Historian Paul Avrich also suspected him but noted that while Schwab was in Chicago, he had only arrived days before. This contradicted statements by others that the bomber was a well-known figure in Chicago. George Meng (b. around 1840) was a German anarchist and teamster who owned a small farm outside of Chicago where he had settled in 1883 after emigrating from Bavaria. Like Parsons and Spies, he was a delegate at the Pittsburgh Congress and a member of the IWPA. Meng's granddaughter, Adah Maurer, wrote Paul Avrich a letter in which she said that her mother, who was 15 at the time of the bombing, told her that her father was the bomber. Meng died sometime before 1907 in a saloon fire. Based on his correspondence with Maurer, Avrich concluded that there was a "strong possibility" that the little-known Meng may have been the bomber. An agent provocateur was suggested by some members of the anarchist movement. Albert Parsons believed the bomber was a member of the police or the Pinkertons trying to undermine the labor movement. However, this contradicts the statements of several activists who said the bomber was one of their own. Lucy Parsons and Johann Most rejected this notion. Dyer Lum said it was "puerile" to ascribe "the Haymarket bomb to a Pinkerton". A disgruntled worker was widely suspected. When Adolph Fischer was asked if he knew who threw the bomb, he answered, "I suppose it was some excited workingman." Oscar Neebe said it was a "crank". Governor Altgeld speculated the bomb thrower might have been a disgruntled worker who was not associated with the defendants or the anarchist movement but had a personal grudge against the police. In his pardoning statement, Altgeld said the record of police brutality towards the workers had invited revenge adding, "Capt. Bonfield is the man who is really responsible for the deaths of the police officers." Klemana Schuetz was identified as the bomber by Franz Mayhoff, a New York anarchist and fraudster, who claimed in an affidavit that Schuetz had once admitted throwing the Haymarket bomb. August Wagener, Mayhoff's attorney, sent a telegram from New York to defense attorney Captain William Black the day before the executions claiming knowledge of the bomber's identity. Black tried to delay the execution with this telegram but Governor Oglesby refused. It was later learned that Schuetz was the primary witness against Mayhoff at his trial for insurance fraud, so Mayhoff's affidavit has never been regarded as credible by historians. Thomas Owen was a carpenter from Pennsylvania. Severely injured in an accident a week before the executions, Owen reportedly confessed to the bombing on his deathbed by saying, "I was at the Haymarket riot and am an anarchist and say that I threw a bomb in that riot." He was an anarchist and apparently had been in Chicago at the time but other accounts note that long before his accident he had said he was at the Haymarket and saw the bomb thrower. Owen may have been trying to save the condemned men. Reinold "Big" Krueger was killed by police either in the melee after the bombing or in a separate disturbance the next day and has been named as a suspect but there is no supporting evidence. A mysterious outsider was reported by John Philip Deluse, a saloon keeper in Indianapolis who claimed he encountered a stranger in his saloon the day before the bombing. The man was carrying a satchel and on his way from New York to Chicago. According to Deluse, the stranger was interested in the labor situation in Chicago, repeatedly pointed to his satchel and said, "You will hear of some trouble there very soon." Parsons used Deluse's testimony to suggest the bomb thrower was sent by eastern capitalists. Nothing more was ever learned about Deluse's claim. 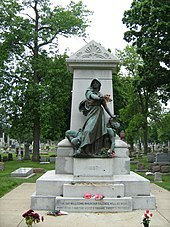 A 2009 image of the Haymarket Martyr's Monument at the Forest Home Cemetery in Forest Park, Illinois. Lingg, Spies, Fischer, Engel, and Parsons were buried at the German Waldheim Cemetery (later merged with Forest Home Cemetery) in Forest Park, Illinois, a suburb of Chicago. Schwab and Neebe were also buried at Waldheim when they died, reuniting the "Martyrs". 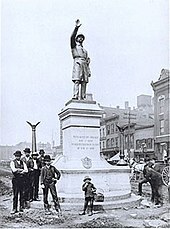 In 1893, the Haymarket Martyrs' Monument by sculptor Albert Weinert was raised at Waldheim. Over a century later, it was designated a National Historic Landmark by the United States Department of the Interior. Throughout the 20th century, activists such as Emma Goldman chose to be buried near the Haymarket Martyrs' Monument graves. In October 2016, a time capsule with materials relating to the Haymarket Affair was dug up in Waldheim Cemetery. Workers finish installing Gelert's statue of a Chicago policeman in Haymarket Square, 1889. The statue now stands at the Chicago Police Headquarters. In 1889, a commemorative nine-foot (2.7 meter) bronze statue of a Chicago policeman by sculptor Johannes Gelert was erected in the middle of Haymarket Square with private funds raised by the Union League Club of Chicago. The statue was unveiled on May 30, 1889, by Frank Degan, the son of Officer Mathias Degan. On May 4, 1927, the 41st anniversary of the Haymarket affair, a streetcar jumped its tracks and crashed into the monument. The motorman said he was "sick of seeing that policeman with his arm raised". The city restored the statue in 1928 and moved it to Union Park. During the 1950s, construction of the Kennedy Expressway erased about half of the old, run-down market square, and in 1956, the statue was moved to a special platform built for it overlooking the freeway, near its original location. The statue-less pedestal of the police monument on the 100th anniversary of the Haymarket affair in May 1986; the pedestal has since been removed. The Haymarket statue was vandalized with black paint on May 4, 1968, the 82nd anniversary of the Haymarket affair, following a confrontation between police and demonstrators at a protest against the Vietnam War. On October 6, 1969, shortly before the "Days of Rage" protests, the statue was destroyed when a bomb was placed between its legs. Weatherman took credit for the blast, which broke nearly 100 windows in the neighborhood and scattered pieces of the statue onto the Kennedy Expressway below. The statue was rebuilt and unveiled on May 4, 1970, to be blown up yet again by Weatherman on October 6, 1970. The statue was rebuilt, again, and Mayor Richard J. Daley posted a 24‑hour police guard at the statue. This guard cost $67,440 per year. In 1972, it was moved to the lobby of the Central Police Headquarters, and in 1976 to the enclosed courtyard of the Chicago police academy. 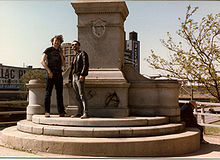 For another three decades the statue's empty, graffiti-marked pedestal stood on its platform in the run-down remains of Haymarket Square where it was known as an anarchist landmark. On June 1, 2007, the statue was rededicated at Chicago Police Headquarters with a new pedestal, unveiled by Geraldine Doceka, Officer Mathias Degan's great-granddaughter. A decade of strife between labor and industry culminated here in a confrontation that resulted in the tragic death of both workers and policemen. On May 4, 1886, spectators at a labor rally had gathered around the mouth of Crane's Alley. A contingent of police approaching on Des Plaines Street were met by a bomb thrown from just south of the alley. The resultant trial of eight activists gained worldwide attention for the labor movement, and initiated the tradition of "May Day" labor rallies in many cities. 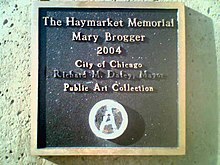 On September 14, 2004, Daley and union leaders—including the president of Chicago's police union—unveiled a monument by Chicago artist Mary Brogger, a fifteen-foot (4.5 m) speakers' wagon sculpture echoing the wagon on which the labor leaders stood in Haymarket Square to champion the eight-hour day. The bronze sculpture, intended to be the centerpiece of a proposed "Labor Park", is meant to symbolize both the rally at Haymarket and free speech. The planned site was to include an international commemoration wall, sidewalk plaques, a cultural pylon, a seating area, and banners, but construction has not yet begun. ^ "Originally at the corner of Des Plaines and Randolph". Cityofchicago.org. Archived from the original on May 6, 2009. Retrieved March 18, 2012. ^ Smith, Carl. "Act III: Toils of the Law". The Dramas of Haymarket. Chicago Historical Society and Northwestern University. Retrieved December 30, 2017. ^ See generally, Gilmer, Harry L. (July 28, 1886). "Testimony of Harry L. Gilmer, Illinois vs. August Spies et al". Haymarket Affair Digital Collection. Chicago Historical Society. Retrieved December 30, 2017. ^ See generally, Thompson, Malvern M. (July 27, 1886). "Testimony of Malvern M. Thompson, Illinois vs. August Spies et al". Haymarket Affair Digital Collection. Chicago Historical Society. Retrieved December 30, 2017. ^ Trachtenberg, Alexander (March 2002) . The History of May Day. Marxists.org. Retrieved January 19, 2008. ^ Foner, "The First May Day and the Haymarket Affair", May Day, pp. 27–39. ^ "The Haymarket Affair". illinoislaborhistory.org. Retrieved October 27, 2017. ^ a b c "Site of the Haymarket Tragedy". City of Chicago Department of Planning and Development, Landmarks Division. 2003. Archived from the original on July 14, 2006. Retrieved January 19, 2008. ^ "Lists of National Historic Landmarks". National Historic Landmarks Program. National Park Service. March 2004. Archived from the original on 2008-07-09. Retrieved January 19, 2008. ^ Huberman, Michael (Dec 2004). "Working Hours of the World Unite? New International Evidence of Worktime, 1870–1913". The Journal of Economic History. 64 (4): 971. doi:10.1017/s0022050704043050. JSTOR 3874986. ^ Barrett, James R. "Unionization". Encyclopedia of Chicago. Chicago History Museum, Newberry Library, Northwestern University. Retrieved April 2, 2012. ^ Moberg, David. "Antiunionism". Encyclopedia of Chicago. Chicago History Museum, Newberry Library, Northwestern University. Retrieved April 2, 2012. ^ Reiff, Janice L. "The Press and Labor in the 1880s". Encyclopedia of Chicago. Chicago History Museum, Newberry Library, Northwestern University. Retrieved April 2, 2012. ^ Kemmerer, Donald L.; Edward D. Wickersham (January 1950). "Reasons for the Growth of the Knights of Labor in 1885–1886". Industrial and Labor Relations Review 3 (2): 213–220. ^ "How May Day Became a Workers' Holiday". The Guide to Life, The Universe and Everything. BBC. October 4, 2001. Retrieved January 19, 2008. (It is) Resolved ... that eight hours shall constitute a legal day's labor from and after May 1, 1886, and that we recommend to labor organizations throughout this district that they so direct their laws so as to conform to this resolution by the time named. ^ "How May Day Became a Workers' Holiday". The Guide to Life, The Universe and Everything. BBC. October 4, 2001. Retrieved January 19, 2008. ^ a b c Avrich, The Haymarket Tragedy, p. 186. ^ a b Foner, May Day, p. 27. ^ Foner, May Day, pp. 27–28. ^ a b Foner, May Day, p. 28. ^ According to Henry David there were strikes by "no less than 30,000 men", and "perhaps twice that number (i.e., 80,000) were out on the streets participating in or witnessing the various demonstrations..."
^ David, The History of the Haymarket Affair, pp. 177, 188. 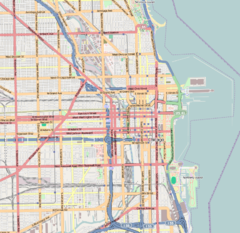 ^ The existence of an 80,000 person march down Michigan Avenue, described by Avrich (1984), Foner (1986), and others, has been questioned by historian Timothy Messer-Kruse, who claims to have found no specific reference to it in contemporary sources and notes that David (1936) doesn't mention it. ^ a b Green, Death in the Haymarket, pp. 162–173. ^ Avrich, The Haymarket Tragedy, p. 190. ^ Avrich, The Haymarket Tragedy, p. 193. ^ Illinois vs. August Spies et al. trial transcript no. 1, 1886 Nov. 26. M. p. 255. Retrieved December 30, 2017. ^ a b Nelson, Bruce C. (1988). 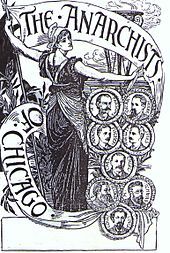 Beyond the Martyrs: A Social History of Chicago's Anarchists, 1870–1900. New Brunswick, N.J.: Rutgers University Press. p. 189. ISBN 0-8135-1345-6. ^ In the Supreme Court of Illinois, Northern Grand Division. March Term, 1887. August Spies, et al. v. The People of the State of Illinois. Abstract of Record. Chicago: Barnard & Gunthorpe. vol. II, p. 129. OCLC 36384114. , quoted in Avrich, The Haymarket Tragedy, pp. 199–200. ^ a b Nelson, Beyond the Martyrs, p. 188. ^ a b c d e "Rioting and Bloodshed in the Streets of Chicago" (PDF). The New York Times. May 5, 1886. Retrieved February 29, 2012. This is the same article datelined May 4, reproduced elsewhere. ^ New York Times article datelined May 4, headlined "Anarchy's Red Hand" and dated May 6, reproduced on the University of Missouri-Kansas City School of Law website. ^ Avrich (1984), pp. 205–206. ^ "Inspector John Bonfield report to Frederick Ebersold, General Superintendent of Police, 1886 May 30". Chicago Historical Society. Retrieved December 30, 2017. ^ "Chicago's Deadly Missile". The New York Times. May 14, 1886. Retrieved February 28, 2012. ^ Schaack, Anarchy and Anarchists, pp. 146–148. ^ Bonfield, John (May 30, 1886). "Inspector John Bonfield report to Frederick Ebersold, General Superintendent of Police". Haymarket Affair Digital Collection. Chicago Historical Society. Retrieved December 30, 2017. ^ Chicago Tribune, June 27, 1886, quoted in Avrich, The Haymarket Tragedy, p. 209. ^ "Act II: Let Your Tragedy Be Enacted Here". The Dramas of Haymarket. Chicago Historical Society. 2000. Retrieved December 30, 2017. ^ Schaack, Michael J. (1889). "The Dead and the Wounded" (PDF). Anarchy and Anarchists. A History of the Red Terror and the Social Revolution in America and Europe. Communism, Socialism, and Nihilism in Doctrine and in Deed. The Chicago Haymarket Conspiracy, and the Detection and Trial of the Conspirators. Chicago: F. J. Schulte & Co. p. 155. OCLC 185637808. Retrieved January 19, 2008. After the moment's bewilderment, the officers dashed on the enemy and fired round after round. Being good marksmen, they fired to kill, and many revolutionists must have gone home, either assisted by comrades or unassisted, with wounds that resulted fatally or maimed them for life. ... It is known that many secret funerals were held from Anarchist localities in the dead hour of night. ^ Chicago Herald, May 5, 1886, quoted in Avrich (1984), pp.209–210. ^ Schaack, Michael J. (1889), Anarchy and Anarchists, pp. 149–155. ^ Nelson, Beyond the Martyrs, pp. 188–189. ^ Avrich (1984), pp. 221–32. ^ a b Morn, Frank (1982). The Eye That Never Sleeps: A History of the Pinkerton National Detective Agency. Bloomington, Ind. : Indiana University Press. p. 99. ISBN 0-253-32086-0. ^ a b c d e f Schaack, "Core of the Conspiracy", Anarchy and Anarchists, pp. 156–182. ^ Schaack, "My Connection with the Anarchist Cases", Anarchy and Anarchists, pp, 183–205. ^ a b Messer-Kruse (2011), pp. 18–21. ^ The Grand Jury returned an indictment against August Spies, Michael Schwab, Samuel Fielden, Albert R. Parsons, Adolph Fischer, George Engel, Louis Lingg, William Seliger, Rudolph Schnaubelt and Oscar Neebe for murder. Charged with making an unlawful, willful, felonious and with malice aforethought assault on the body of Mathias J. Degan causing him mortal wounds, bruises, lacerations and contusions upon his body. See Grand jury indictments for murder, 1886 June 4.| Chicago Historical Society, Haymarket Affair Digital Collection. ^ "Meet the Haymarket Defendants". University of Missouri-Kansas City School of Law. Retrieved December 30, 2017. ^ Avrich, The Haymarket Tragedy, pp. 271–272. ^ Robert Loerzel, Alchemy of Bones: Chicago's Luetgert Murder Case of 1897 (University of Illinois Press; 2003), p. 52. ^ "Act III: Toils of the Law, Court of Public Opinion". The Dramas of Haymarket. Chicago Historical Society. 2000. Retrieved December 30, 2017. From the time of the arrests following the riot to the hangings, the men held responsible for the bombing found the celebrity that they had been so eagerly seeking, if hardly on the terms they desired. ... In almost all instances, the accused achieved notoriety rather than fame, though reporters frequently remarked on their bravery in the face of the awesome fate awaiting them, and on their devotion to their families. Even these stories, however, emphasized their fanaticism and wrong-headed dedication to a dangerous and selfish cause that only hurt the ones they supposedly loved. ^ "Anarchy's Red Hand: Rioting and Bloodshed in the Streets of Chicago". The New York Times. May 6, 1886. Retrieved December 30, 2017. ^ The New York Times, May  6, 1886, quoted in Avrich, The Haymarket Tragedy, p. 217. ^ Avrich, The Haymarket Tragedy, p. 216. ^ Parsons, George Frederic (July 1886). "The Labor Question". The Atlantic Monthly. 58: 97–113. ^ "Act III: Toils of the Law". The Dramas of Haymarket. Chicago Historical Society. 2000. Retrieved December 30, 2017. ^ Loertzel, Alchemy of Bones, p. 52. ^ 122 Ill. 1 (1887). ^ 123 U.S. 131 (1887). ^ "Lingg's Fearful Death". Chicago Tribune. November 11, 1887. p. 1. ^ a b Avrich, The Haymarket Tragedy, p. 393. ^ Messer-Kruse (2011). p. 181. ^ John J. Miller, "What Happened at Haymarket? A historian challenges a labor-history fable", National Review, February 11, 2013. Retrieved September 6, 2017. ^ "Building the Digital Collection". Chicago Historical Society. Retrieved December 30, 2017. ^ John A. Farrell, Clarence Darrow: Attorney for the Damned (New York: Doubleday, 2011), p. 5 and passim. ^ "Anarchists Pardoned". Port Huron Daily Times. Port Huron, Michigan. June 27, 1893. p. 1. Archived from the original on June 27, 2018. Retrieved May 4, 2018 – via Newspapers.com. ^ Quoted in Stanley Turkel, Heroes of the American Reconstruction: Profiles of Sixteen Educators (McFarland, 2009) p. 121. ^ Morn. The Eye That Never Sleeps. p. 99. ISBN 0-253-32086-0. On April 9, 1885, Pinkertons shot and killed an elderly man at the McCormick Harvester Company Works in Chicago. On October 19, 1886, they shot and killed a man in Chicago's packinghouse district. More info. ^ Illinois Governor John Peter Altgeld National Governors Association (2011). ^ The Debs Case: Labor, Capital, and the Federal Courts of the 1890s, Biographies, John Peter Altgeld Federal Judicial Center. ^ a b c Teaford, Jon C. (2006). "Good Read, Old Story – Death in the Haymarket: A Story of Chicago, the First Labor Movement and the Bombing that Divided Gilded Age America by James Green". Reviews in American History. 34: 350–354. JSTOR 30031536. ^ Thale, Christopher. "Haymarket and May Day". Encyclopedia of Chicago. Chicago History Museum, Newberry Library and Northwestern University. Retrieved April 1, 2012. ^ Smith, Carl. "Introduction". The Dramas of Haymarket. Chicago Historical Society and Northwestern University. Retrieved December 30, 2017. ^ Mann, Leslie (September 14, 2011). "Reworking infamous Haymarket trial". Chicago Tribune. Retrieved November 1, 2017. ^ Foner, The Autobiographies of the Haymarket Martyrs, p. 13. ^ a b Nathan Fine, Labor and Farmer Parties in the United States, 1828–1928. New York: Rand School of Social Science, 1928; pg. 53. ^ "Co-operation of Labor. Interview with Senator Stanford. Reasons why the Laboring Man Should Be His Own Employer—Delusive Theories About the Distribution of Wealth". New-York Tribune. May 4, 1887. Retrieved May 1, 2015. ^ Foner, May Day, p. 40. ^ Foner, May Day, p. 41. ^ a b Foner, May Day, p. 42. ^ Foner, May Day, p. 45. ^ Foner, May Day, pp. 45–46. ^ Roediger, Dave, "Mother Jones & Haymarket", in Roediger and Rosemont, eds., Haymarket Scrapbook, p. 213. ^ Foner, May Day, p. 104. ^ Foner, May Day, p. 118. ^ Avrich, The Haymarket Tragedy, p. 436. ^ Goldman, Emma (1970) . Living My Life. New York: Dover Publications. pp. 7–10, 508. ISBN 0-486-22543-7. ^ a b Avrich, The Haymarket Tragedy, p. 434. ^ Avrich, The Haymarket Tragedy, pp. 433–434. ^ Gilmer, Harry L. (July 28, 1886). "Testimony of Harry L. Gilmer, Illinois vs. August Spies et al". Haymarket Affair Digital Collection. Chicago Historical Society. Retrieved December 30, 2017. ^ Thompson, Malvern M. (July 27, 1886). "Testimony of Malvern M. Thompson, Illinois vs. August Spies et al". Haymarket Affair Digital Collection. Chicago Historical Society. Retrieved December 30, 2017. ^ After the hangings, Reitzel reportedly told Dr. Urban Hartung, another anarchist, "The bomb-thrower is known, but let us forget about it; even if he had confessed, the lives of our comrades could not have been saved." Letter from Carl Nold to Agnes Inglis, January 12, 1933, quoted in Avrich, The Haymarket Tragedy, p. 442. ^ Messer-Kruse, The Trial of the Haymarket Anarchists, p. 74. Avrich also suggests the bomber might have been a shoemaker named George Schwab (no relation to hanged defendant Michael Schwab). Anarchist George Meng, has recently also been mentioned "Who Threw the Bomb", The Dramas of the Haymarket, Chicago Historical Society and Northwestern University website. ^ Messer-Kruse, The Trial of the Haymarket Anarchists, p. 182. ^ Lucy Parsons stated that Harris's book "was a lie from cover to cover". Letter from Lucy Parsons to Carl Nold, January 17, 1933, quoted in David, The History of the Haymarket Affair, p. 435. ^ David, The History of the Haymarket Affair, p. 428. ^ Avrich, The Haymarket Tragedy, pp. 444–45. ^ Avrich, Paul, "The Bomb-Thrower: A New Candidate", in Roediger and Rosemont, eds., Haymarket Scrapbook, pp. 71–73. ^ Dyer Lum, quoted in David, The History of the Haymarket Affair, pp. 426–427. ^ David, The History of the Haymarket Affair, pp. 430–431. ^ Altgeld, John P. (June 26, 1893). "Reasons for Pardoning Fielden, Neebe and Schwab". Haymarket Affair Digital Collection. Chicago Historical Society. Retrieved December 30, 2017. ^ David, The History of the Haymarket Affair, pp. 428–429. ^ David, The History of the Haymarket Affair, p. 430. ^ David, The History of the Haymarket Affair, p. 431. ^ Avrich, The Haymarket Tragedy, pp. 444. ^ David, The History of the Haymarket Affair, pp. 429–430. ^ Parsons, Albert R. (1886). "Address of Albert R. Parsons". The Accused, The Accusers: The Famous Speeches of the Eight Chicago Anarchists in Court. Chicago Historical Society. Retrieved December 30, 2017. ^ "Haymarket time capsule uncovered, still unopened". www.forestparkreview.com. Retrieved October 22, 2017. ^ Adelman, Haymarket Revisited, pp. 38–39. ^ a b "Haymarket Statue Rededication Ceremony at Police Headquarters". Chicago Police Department weblog. Chicago Police Department. May 31, 2007. Archived from the original on December 18, 2007. Retrieved January 23, 2008. ^ a b Adelman, William J., "The True Story Behind the Haymarket Police Statue", in Roediger and Rosemont, eds., Haymarket Scrapbook, pp. 167–168. ^ a b Adelman, Haymarket Revisited, p. 39. ^ a b c d Adelman, Haymarket Revisited, p. 40. ^ a b c Avrich, The Haymarket Tragedy, p. 431. ^ Kinzer, Stephen (September 15, 2004). "In Chicago, an Ambiguous Memorial to the Haymarket Attack". New York Times. Retrieved January 20, 2008. Adelman, William J. (1986) . Haymarket Revisited (2nd ed.). Chicago: Illinois Labor History Society. ISBN 0-916884-03-1. Avrich, Paul (1984). The Haymarket Tragedy. Princeton, NJ: Princeton University Press. ISBN 0-691-00600-8. David, Henry (1963) . The History of the Haymarket Affair: A Study of the American Social-Revolutionary and Labor Movements (3rd ed.). New York: Collier Books. OCLC 6216264. Foner, Philip S., ed. (1969). The Autobiographies of the Haymarket Martyrs. New York: Pathfinder Press. ISBN 0-87348-879-2. Foner, Philip S. (1986). May Day: A Short History of the International Workers' Holiday, 1886–1986. New York: International Publishers. ISBN 0-7178-0624-3. Green, James R. (2006). Death in the Haymarket: A Story of Chicago, the First Labor Movement and the Bombing that Divided Gilded Age America. New York: Pantheon Books. ISBN 0-375-42237-4. Messer-Kruse, Timothy (2012). The Haymarket Conspiracy: Transatlantic Anarchist Networks. Urbana, Ill.: University of Illinois Press. ISBN 0-252-07860-8. Messer-Kruse, Timothy (2011). The Trial of the Haymarket Anarchists: Terrorism and Justice in the Gilded Age. New York: Palgrave Macmillan. ISBN 978-0-230-12077-8. Nelson, Bruce C. (1988). Beyond the Martyrs: A Social History of Chicago's Anarchists, 1870–1900. New Brunswick, NJ: Rutgers University Press. ISBN 0-8135-1345-6. Roediger, David; Rosemont, Franklin, eds. (1986). Haymarket Scrapbook. Chicago: Charles H. Kerr Publishing. ISBN 0-88286-122-0. Schaack, Michael J. (1889). Anarchy and Anarchists. A History of the Red Terror and the Social Revolution in America and Europe. Communism, Socialism, and Nihilism in Doctrine and in Deed. The Chicago Haymarket Conspiracy, and the Detection and Trial of the Conspirators. Chicago: F. J. Schulte & Co. OCLC 185637808. Smith, Carl (2000). "The Dramas of Haymarket". Chicago Historical Society and Northwestern University. Retrieved December 30, 2017. Bach, Ira J.; Mary Lackritz Gray (1983). A Guide to Chicago's Public Sculpture. Chicago: University of Chicago Press. ISBN 0-226-03399-6. Fireside, Bryna J. (2002). The Haymarket Square Riot Trial: A Headline Court Case. Berkeley Heights, N.J.: Enslow Publishers. ISBN 0-7660-1761-3. Harris, Frank (1908). The Bomb. London: John Long. OCLC 2380272. Hucke, Matt; Ursula Bielski (1999). Graveyards of Chicago: The People, History, Art, and Lore of Cook County Cemeteries. Chicago: Lake Claremont Press. ISBN 0-9642426-4-8. Kvaran, Einar Einarsson. Haymarket — A Century Later (unpublished manuscript). Lieberwitz, Risa, "The Use of Criminal Conspiracy Prosecutions to Restrict Freedom of Speech: The Haymarket Trial," in Marianne Debouzy (ed. ), In the Shadow of the Statue of Liberty: Immigrants, Workers, and Citizens in the American Republic, 1880–1920. Urbana, IL: University of Illinois Press, 1992; pp. 275–291. Lum, Dyer (1887). A Concise History of the Great Trial of the Chicago Anarchists in 1886. (reprint in 2005) Adamant Media Corporation. ISBN 978-1-4021-6287-9. McLean, George N. (1890). The Rise and Fall of Anarchy in America. Chicago: R.G. Badoux & Co.
Parsons, Lucy (1889). Life of Albert R. Parsons : with brief history of the labor movement in America. Chicago: L. E. Parsons. Riedy, James L. (1979). Chicago Sculpture: Text and Photographs. Urbana, Ill.: University of Illinois Press. ISBN 0-252-01255-0. Smith, Carl (1995). Urban Disorder and the Shape of Belief: The Great Chicago Fire, the Haymarket Bomb, and the Model Town of Pullman. Chicago: University of Chicago Press. ISBN 0-226-76416-8. Wikimedia Commons has media related to Haymarket Riot. This page was last edited on 2 April 2019, at 23:24 (UTC).